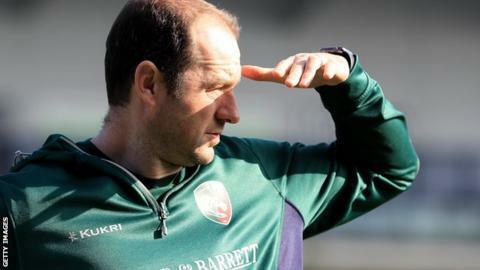 Leicester Tigers are probably in the "worst period in their history", according to head coach Geordan Murphy. Tigers have never finished in the bottom half of the Premiership, but are currently third from bottom and deep in relegation trouble, having won just six league games all season. "It makes me feel horrific," Murphy told BBC Radio Leicester. "Confidence is very low. It's difficult to keep yourself up, but we have no option. We are in a dogfight now." A 29-15 home defeat by fierce rivals Northampton Saints and wins for Worcester and Newcastle at the weekend left Leicester legend Murphy in no doubt about the scale of the task his side face. "It probably is the worst period in Leicester Tigers' history," the 40-year-old said. "So to be in charge of it, having played for the club knocking on 350 times, is a tough one to take. "For myself and the other coaches, who are dedicating our lives to it, it's not something we do on a Tuesday and a Thursday and walk away and have a beer on a Saturday. "It affects our home lives, our family lives and our personal lives. We don't sleep and we worry. At the end of the day it is a sport, but it means so much to the people involved so it's tough." He continued: "We have been under pressure all season; we have not performed anywhere near as well as we could. "It's a big melting pot of issues, but it is what it is. There are no excuses from me. The guys who are here all want to be here and putting the shirt on. We have a bunch who are working very, very hard to get it right." Eight teams are separated by just 12 points, while the bottom four have just seven points between them. Murphy, who took over as head coach in December after an interim spell in charge, said trying to restore confidence was key to turning things around. "It's incredibly boring but it is genuinely one game at a time," he added. "It's just trying to scrap for everything and that is where we are at. If you get a run of a few wins then you find yourself climbing the table very quickly. "Everyone seems to be knocking each other over. It is very tight in the middle so it's not all doom and gloom. I find it difficult to swallow but we are where we are."